We finally made it to Destin on the 20th of December after a little detour to Vegas for Lib and Led's wedding! These are just a few pictures to let you share in our adventure. 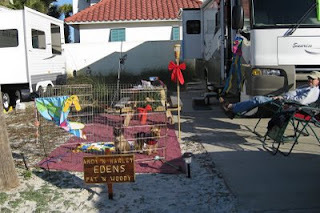 Our friend Lou made us a sign that is proudly installed in front of our motor home at Camping on the Gulf in Destin! The boys love that they were included! Harley isn't wild about the new playpen. We had hoped he wouldn't jump the fence, but of course he did. But always prepared, we brought deer netting. He figured out how to get under the one loose spot needed to open the gate. At least he just runs for the door to the coach! As you can also see from the picture, Woody is ensconced in his usual chair (thanks Holly and Jan!). 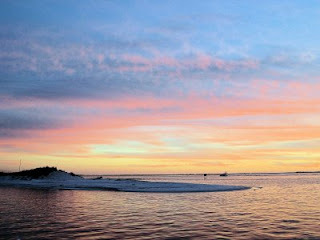 The sunset is at the Pass at Destin Harbour as is our picture! We love the new area around the Emerald Grande and Harbourwalk. When we win the lottery, we're going to buy a condo there! We are back to thinking about a more permanent place down here! We would miss Christmas dinner at the campground...the food this year was wonderful. We're doing water aerobics on Monday, Wednesday and Friday and trying to walk on the other days of the week...too bad that we're eating even more. Who knew that exercise would stimulate your appetite! Tomorrow is New Year's Eve and we're joining friends at Capt. Dave's on the beach for dinner and then back to our beach to watch fireworks. We can see both Destin and Sandestin's fireworks. Life in retirement just gets better and better! I'm still doing a little bit of editing and consulting, but with the price of gas down, I don't need to work as much! We're still planning on Nova Scotia this summer. Hope you all have a wonderful, happy and healthy New Year! Check out Woody's Christmas present I won with all my gambling winnings! In other words, I could afford to put his name on the car only!! As many of you know, I spent all summer tracking a "horny moose"...in other words, a moose with horns. While I got a cow moose, I never found a horny moose. My BFFs Jane and Bill bagged me a horny mousse! My life is complete! We finally arrived in Florida Saturday night after a bit of trauma. We were loading the coach and I wanted to fill the hot water heater. When we turned on the water, it went everywhere! We had our sink water filter tube break! Woody, who as you know is great at a lot of things but plumbing is not one of them, capped it off and we headed out! I'm so proud of him! Then we arrived here to plug in and got a 50 amp message when we have a 30 amp coach! I decided to just deal with it later since everything was working and it may have been a computer fault...said a little prayer, and woke up this morning to everything working...thank you Lord! It was beautiful last night but today we have the cold front. It's in the 50's and will drop to the 30's tonight. Tomorrow though and through Christmas, back in the 70's! Just watched the Titans beat the Steelers...anyone that wants to buy football playoff tickets, let me know. We won't be there for the playoff game! We're keeping our fingers crossed that we'll make the Super Bowl which is in Tampa! We'll just unhook and drive right on down from Destin! We just love Camping on the Gulf! Our friends are all here with just a few exceptions who've had some health problems this year. As we all get old, I'm sure we'll see fewer each year...sending a little prayer for good health to everyone! Can't wait for David and Estelle to get down to start up our canasta tournament for 2008! Hope you'll all have a blessed and happy Christmas week! Libby and Led are married! 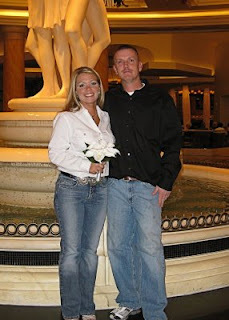 We had a great weekend in Las Vegas and married off Libby to Led!! It was a great time...they stayed at Caesars Palace and we were at Paris! http://www.parislasvegas.com/ Both hotels were great...the slots were even loose at Paris! At least I didn't lose too much other than a daughter! 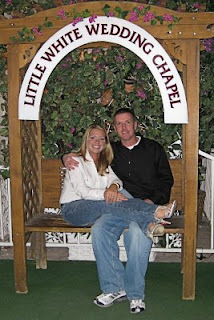 The wedding was at the Little White Wedding Chapel where tons of celebrities have tied the knot! Even better...we wore jeans! No mother of the bride junk for Marilyn and me! Here are a few pictures! Enjoy! The kids will be home on Wednesday! Hopefully they will have a dollar or two left! Big hugs to all of you. We head to Florida this weekend, so watch for posts! If you've never seen "Ragtime the Musical" you should definitely go! 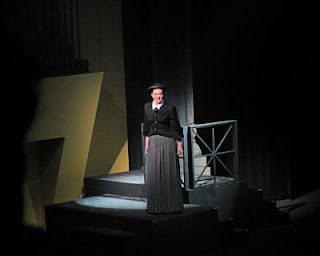 Our beautiful niece (although you can't tell it from this costume) did an incredible job in her role as Emma Goldman inthe play at Belmont University. It was fun seeing Janis and Mike and Janis's mom, but Woody was sick as a dog! I can't believe that Jessica graduates in the spring! We had a wonderful trip to NC to visit the grandkids. 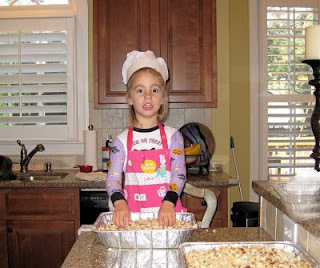 Mimi and Riley made turkey bread, which most of you will recognize as cornbread dressing! 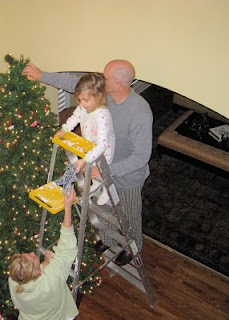 We put up the Christmas tree and had a wonderful time. 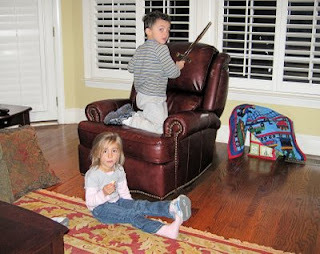 Molly and her clan came for Thanksgiving dinner and Riley and Sebastian played all day with swords and early Christmas presents that Mimi and Grandad brought. I even made train blankets for the little ones! I'm just getting so domestic in my retirement. Jennifer cooked an incredible meal! It's so nice to have a gourmet cook for a daughter-in-law...although I just consider her a daughter! She is wonderful! I'm so blessed to have her trying to control my son! Unfortunately Ole Miss (her alma mater) destroyed Miss State (Woody's alma mater) so that was the only depressing part of the weekend. The weather was great until we left and we had snow from just outside of Ashville, NC all the way to Cookeville, TN! Slow going when you're out of practice driving in the snow. We've had a great time catching up with all our friends but I'm so ready to go to Florida! We won't get to spend as much time this year due to my friend the dentist! Still not finished, but I'm taking a month off to run south and then we'll head back north and finish up the mouth! It had better be worth it when all is said and done...although the work so far is divine! I should have done this years ago. We're off to Las Vegas on Thursday for Libby's wedding...yep, she's going to tie the knot! I'm delighted that she and Led are so happy together...no pressure, but Mimi would like more grandchildren! http://www.parislasvegas.com/ This time we're staying at Paris! We're having dinner with Margaret and then just playing for a bit...not sure what show we'll see; we've about seen them all! My gambling is limited now that we're old and retired. I'll try to do better on posting more often...we've just been busy busy busy as we say in the Edens household! Happy Holidays and Merry Christmas! At this time of year, I get really sentimental. Woody and I are big Thanksgiving people...less so Christmas. We're gathering up all our stuff to go to see the grandkids, and wait for it, including the stuffing...or dressing as we say in the south. Our son thinks no one can make dressing as good as Mom! I make one pan of oyster dressing and one "plain". Ginny is our pet sitter for the weekend. She's great and the boys love her! I just want to wish all of you a wonderful holiday season...we are so blessed to have the best family and friends a couple could want. Tomorrow we go to an 80th birthday party for a dear friend, and to our niece's Christmas musical at Belmont. Life is good! I'll write more on Sunday to brag on Jessica! I'm so ready for Florida! I am so ready to head to Florida!! It's really getting cold here in Hendersonville! We've had a great week...finished our Christmas shopping and will get it all wrapped this week. I'm finishing up quilts for Sebastian and Riley to use when they watch TV. Most of the stuff is going to Charlotte with us for Thanksgiving so we have to have it all ready. Friday night we went back to 2 Country...slightly different band, but still playing songs I don't know. We left early. Tonight we went to Red Lobster and celebrated Woody's birthday a few days early. I have to go to the dentist again Monday, so we thought Monday might be an issue. This week is the first week that I felt just a tinge of boredom in retirement. After two years of being retired, I guess this is a pretty good track record. I think it's because it's cold and dreary and I thrive on sunshine. I thought about applying for a job in Obama's administration but think I might have too many crazy relatives and difficult children to survive the vetting process. The application is 63 questions, and basically, if you don't walk on water, forget it! I really don't want to go back to anything remotely like I left, so I'm trying to imagine what it is I would like to do. I wish we had liked retail a bit better, as Halo Properties in Hendersonville is going to build work/live lofts near Indian Lake Village! That would be way cool. Walk to shopping, restaurants, book store and movies!! So if any of you have suggestions about what I should be when I grow up, let me know. We went to the new James Bond movie, Quantum of Solace, and it was fabulous. It was so fast paced that I had trouble catching my breath. This is the first movie since Mama Mia that we wanted to see. I think Hollywood forgets us oldsters! I guess we could move to California and become actors, or maybe extras! The only problem with that is we have no talent. My sister got that! Notre Dame finally won today! I'm not sure what's going on with our quarterback...he showed up in a fur coat the first time he rolled into South Bend as cocky as you want a QB to be, and everyone thought he would be fabulous. None of the Clawson boys are living up to their expectations. Oh well...hopefully we'll improve. And then of course tonight, Alabama beat Mississippi State so Woody's bummed. Hope you all have a wonderful week! As many of you know, I was a huge Hillary Clinton supporter who unwillingly transitioned to Barack Obama. In listening to his speech on Tuesday evening, I harkened back to the days of John F. Kennedy...I felt a sense of excitement about our country and hope for the future that I haven't felt since Bill Clinton was elected! Watching the diverse crowd of supporters, I remembered coming of age in the 1960's and, even then, hating the black-white divisiveness that poisoned our country. I guess I've always been a liberal! Having been raised by the most wonderful black women and white women in Jackson, TN, (it took a lot of people to get me to where I am today!) I was so proud that our country selected the best man for the job. That being said, I'm tired of talking about race...Barack Obama is both white and black, and represents the best in our country...so get over it! He's going to be an excellent president if we support him and do our best to address the issues that are confronting our country! So...here's what we need to do. We need to put aside partisan politics, confront the needs of our country and not the special interests, live within our means, recognize that family values are not owned by the GOP and that we need to focus on the needs and responsibilities of and to our families, address the need to offer healthcare for all, and generally get on with re-establishing our country as the world leader! During this election cycle, I've blogged under the name HealthcareforAll on everything from the Washington Post to the NY Times to MSNBC and CNN! I've tried to keep my blog for fun things...but today, I just felt like sharing with you my thoughts on the election. Please indulge me! Promise that you'll keep an open mind if you didn't vote for President-elect Obama; and if you did, be ready to help our country get back on track! Have a great weekend! I'm still recovering from lots of dental work with more to come, so my weekend will be quiet! and soft! Just now recovering my voice after screaming my head off last night at the Titans Colts game! We won! Our guys looked fabulous in the 2nd half...did worry a bit at the beginning because we looked flat. Like a lot of people, I think our guys didn't really believe that they could beat Indianapolis...Lou Holtz has a saying: Ability is what you're capable of doing. Motivation determines what you do. Attitude determines how well you do it! As a Notre Dame grad who was on campus for the 1988 National Championship, Lou can do no wrong! I need to get motivated! There is so much I need to do here in the house, but I just can't get motivated to tackle anything for some reason. Woody helped me put some storage in the closet in my office and I can't even find the energy to clear my desk and put things away! And heaven knows, I can't get motivated to diet and exercise! The flower beds are still only half cleared from the horrid bermuda grass our neighbor used in his yard. He has the only bermuda grass in the neighborhood and our beautiful yards are being infested! Well, at least bermuda does well in the hot, dry summer...and with global warming it may be the way to go! Maybe tomorrow will find me more energized! 2 Country, Reese's mom, Leona Williams! ing with all our buds! Hence the minimal posts! We've had dinner with Cindy and Lou at a cool place in Bellevue! A week ago Friday, we were at the Gallatin Senior Center being groupies for Bill and Jane and I got to sing back-up again! Shades of high school...I was a senior then too! Ginny and Elroy joined us and had fun. Woody convinced me I should join him at a Good-Guy's car show http://www.good-guys.com/news/hotNews.aspx ...if someone invites you to that...be afraid, be very afraid!! There were thousands of cars! Andy and I pooped out and visited horses, goats and the drag races so we could sit on the bleachers! The truck he's standing by say's "Woodies"! We also went to our niece Jessica's senior recital at Belmont...that girl has more talent in her little finger than I do in my short, squatty body! She's a music theater major and incredibly talented. http://www.youtube.com/watch?v=3vWgZfS0oTM ; http://www.youtube.com/watch?v=zzbZKBMEHBA Hopefully this link works...it's taken from one of her friend's cell phones! 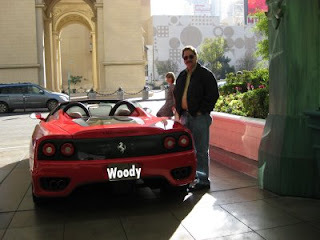 Yesterday, a quick trip to the Prime Outlets in Lebanon... http://www.primeoutlets.com/ Woody needed Nautica shirts! They were on sale...we retired people with crashing 401(K)'s need to watch our pennies! Thank heavens for a conservative retirement plan with cash!! My excitement was a new pair of tennis shoes...although I'm not sure why I persist in calling them tennis shoes since they are for walking...I do have tennis shoes but they have a different sole! or maybe soul! These are New Balance which are supposed to be good for old people! Well off to watch football, and tomorrow night we go to the Titans-Colts game! We may actually have a chance with Peyton under the weather! Just a quick note to all of you following Woody and Pat's excellent adventure...we're home! We'll be here for a while visiting kids and doctors and dentists, oh my! I'll still drop a line occasionally if something fun happens while we visit with the kids and grandkids. We hope you've enjoyed our blog! Woody and I are almost home! 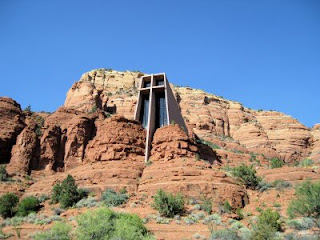 We loved Sedona and found a bit more information about the Chapel of the Holy Cross that we found interesting. It was designed by Marguerite Brunswig Staude, a pupil of Frank Lloyd Wright, and completed in 1956. We lit candles for all of you! The views are beautiful. We drove across New Mexico...boring! Did have some great barbeque in Elk City, Oklahoma at the Hog Trough. Great little local place with the best barbeque I've had in years!!! We're in Hot Springs, Arkansas for the weekend. It was really depressing to see the downtown area...I remember it from when there were high end antique stores and auctions and the bath houses were still open. Now there is only one bath house that is operational and it's working on increasing services. Supposedly there are others that are being renovated in hopes that they can be leased. Coys Steakhouse is still here, and the race track seems to have some casino gambling. It's under construction so we didn't go. We are going for a bath and a massage tomorrow morning at my old favorite, the Arlington Hotel! http://www.arlingtonhotel.com/ The mineral baths are therapeutic of course! 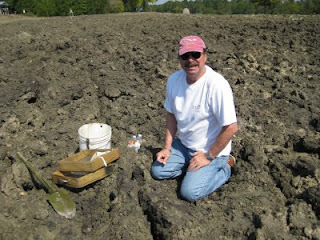 We finally got to dig for diamonds in Crater of Diamonds Park in Murfreesboro, Arkansas. 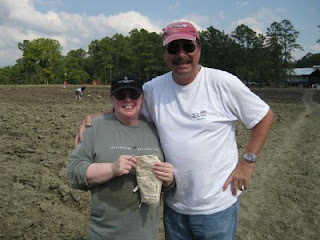 We found absolutely nothing but had fun playing in the dirt...literally...check out the pictures of us filthy!! 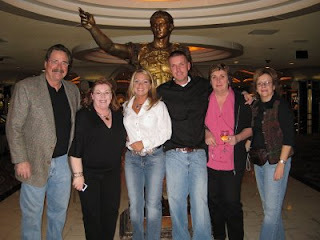 Monday we're off to Tunica to meet Janet and Roy Lynn! A little gambling and a big buffet...we're od'ing on vegetables! We've eaten at three Cracker Barrels in the last week!! Tuesday we head to H'ville! Almost 3,000 miles and about $150 worth of gas a day not to mention every KOA campground from Hendersonville to West Yellowstone to Hendersonville! www.koa.com We've had great KOA experiences this entire trip except for one quite crochety old man in Alma, Arkansas (although he was efficient! ), and of course, the KOA that wasn't in Cheyenne, Wyoming! I can't believe we're almost home...Happy early Birthday to Ginny!!! See you Tuesday! As usual...run by Xanterra! They do a great job. 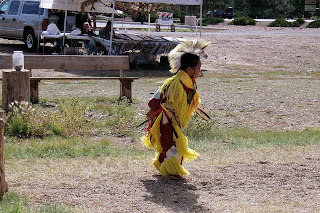 We also stopped at a crafts fair put on each weekend by the Navajo Indians...the little girl was dancing to her grandfather's drum and chanting...of course, we had to put money in the tip jar. 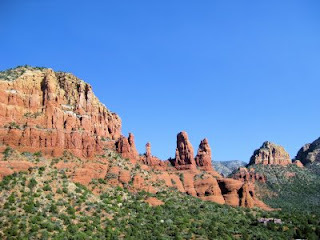 Some of the jewelry was beautiful, but I'm looking for something to knock my socks off...and we're going to Sedona tomorrow! That's Monday....keep watching! A great time in Moab, Utah! 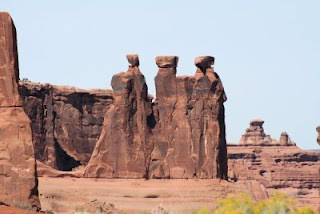 We loved Arches National Park, Dead Horse Point State Park and Canyonlands National Park, all near Moab, Utah! 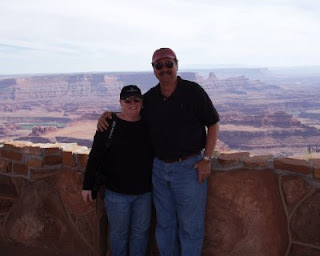 Our picture was taken at Canyonlands. The arch and the Three Gossips stone columns are at Arches National Park. The stone is literally shaped and formed by water, erosion and wind. The park is quite impressive. Dead Horse Point is where horses were rounded up, driven through a 30 yard opening onto a bluff, where the landscape provided a natural corral…unfortunately, someone forget the horses and the story is that they died of thirst or jumped to their death trying to get water…gross! 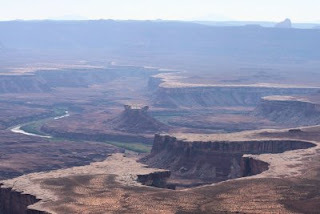 Canyonlands is fascinating and the river you can see is the Colorado. We stayed at a great KOA camp just outside of Moab. We left Moab heading to Las Vegas where we celebrated our 24th anniversary by going to see Jersey Boys, a fabulous musical based on Frankie Valli and the Four Seasons. Turns out Bob Gaudio who wrote most of the songs is living in Nashville and has a boat at Commodore Yacht Club! Or at least that's the hint we interpreted! I gambled at the new Palazzo that is part of The Venetian...it's beautiful but I still lost...well I won a lot and put it all back so Woody says I have to say I lost! We had a wonderful dinner with Paul and Margaret at The Capital Grill...Woody is still raving that he had the best steak he's ever had. Thanks Paul and Margaret for a wonderful dinner and great company! We left Vegas this morning in 95 degree heat! What happened to chasing 72? 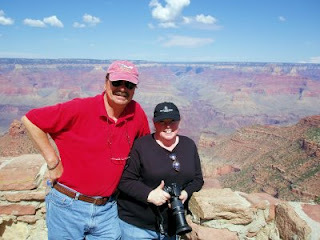 Tomorrow we head to the Grand Canyon and then on Monday to Sedona. We're staying in Williams, AZ and plan to drive to both...they are each about 60 miles from here so it's cheaper to do it in the car at 25 miles a gallon than at 8 miles a gallon in the RV! Plus the boy's get to stay in air conditioned comfort while we're gone. Thank heaven for Andy's blue pads and Harley's litter box...it allows us some flexibility! We'll update you on the latest trips later! Bright and early on Sunday morning, we headed out south...just to wish us good-bye on Saturday night while we were working our last night in the store, we had hail, driving rain and now it's cold! 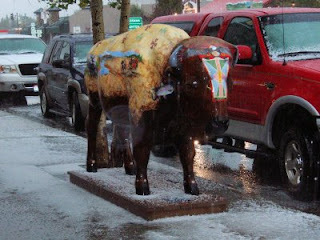 This is the Buffalo outside our store! We'll be on the road until around the 7th of October so watch for our posts. We have to say many thanks to Brenda for allowing us to work at Buffalo Trading Company http://buffalotradingcompany.net/index.html this summer. It's been a wonderful experience and let us know we weren't cut out for a gallery! We loved staying at Fort Jax RV Park [623 Madison Ave West Yellowstone, MT 59758 (406) 646-7729] and Justin and his dog Marley are wonderful! We highly recommend it if you can get in...the RV park stays full but he also has a cabin for rent that is precious! Please say: "I saw your listing #173846 on VRBO". It's listed on Vacation Rentals By Owner and you can see tons of pictures. 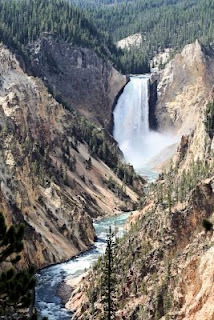 If you're planning a trip to Yellowstone, it's a great place to stay! We'll miss our friends Dave and Geri, but we're already planning for future meetings! After all we worked together in Florida and now Montana! Who knows where we'll end up. We're in Park City, Utah tonight at the Park City RV Resort www.parkcityrvresort.com It's a great RV park...we stayed here tonight so we could go to WalMart...remember, we lived in a city of less than 1500 for five months without one! 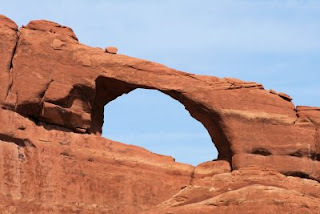 Once we get our prescriptions filled and pick up a few essentials, it's on to Arches National Park in Moab, Utah! More great photo ops! By the way...we know we're old...we wore our house shoes all day as we drove down to Park City...we did put on shoes when we got out!! Just a few more cool pictures! Be sure to read the previous post, but here are three more pictures that are cool! This is the Lower Falls in Yellowstone, the White Dome Geyser in the Firehole Geyser area in Yellowstone, and a bugling elk...he was not happy with us. It just dawned on me that I missed posting last week! Things have been hectic as we wrap up the last few weeks in West Yellowstone! We had dinner at Henry's Fork Lodge in Island Park, ID http://www.henrysforklodge.com/ that was divine, and at our boss's house with some new friends and our friends from last summer, Dave and Geri! Brenda and Ernie's house is to die for...right on Hebgen Lake with fabulous views of the mountains. If our kids and grandkids weren't so far away, they might have some new neighbors. We went out on the porch after dinner and heard hundreds of coyotes howling in the woods! A bit spooky. Henry's Fork Lodge is world renowned and has some of the best fly fishing in the world! We've been moose hunting again..still no luck finding a moose with horns. So Sunday we followed the Snake River all the way to Jackson, WY as we had heard there were moose...there was one...female of course...no horns. So I bought a necklace with a moose! Who said I'm not flexible? We do so love Jackson Hole! We also had to hug on a bison of course! I'm kissing him good-bye! On our way back to West, we passed this incredible sunset over Lewis Lake! I've seen a lot of sunsets on beaches all over the world, but this is the most beautiful one I've seen in a long time! This is straight out of the camera...no editing! Can you believe it? We also hiked a bit...by the way...notice the sweaters! It's already cold here and tomorrow we're expecting snow. This summer has been unbelievable. I love the mountains...maybe even more than the beach! We've been so blessed to meet lots of wonderful people, see scenery that is really almost like a movie, and enjoy small town living. Last week we went to Bozeman to the WalMart...as you recall it's 90 miles away! We went Christmas shopping. Our adopted town of 1500+ people is not that affluent and many of the locals lose their jobs at the close of the summer season until snowmobile season starts in late December and January. We purchased toys and donated them to the Social Services Agency here in West Yellowstone...they promised to hold them until Christmas and share them with families who need toys for their children. Sort of like Toys for Tots but we had the fun of picking out the toys! We love this town and feel it only appropriate to give back a bit before we leave. Of course, Woody keeps buying things in the store and giving them to kids who come in! So I guess we've been playing a bit of Santa all summer! When you're blessed...pass it on! We may not be the "churchiest" people you know, but we try to walk the walk! Today we had a massage that made us feel much better! It was a present from Brenda...she's about the best boss we've ever had! Tomorrow we're going moose hunting again...this time in Yellowstone. There is one lake that is supposed to be a moose hang out...so we're going to hang out! 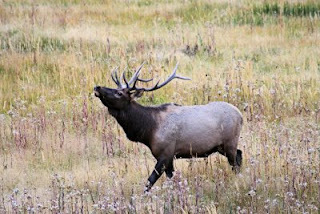 The bison and elk are getting a bit...shall we say...randy...have to watch out if you get to close! We've been excited at how many pictures we've sold from here...from the cards in the store to online sales...I really thought I was doing good until I went into a photographer's gallery in Jackson yesterday...wow...I'm a rank amateur! I can see that I have tons more to learn. Get ready! Dancing with the Stars starts next week! Go Julianne! and Derek and Mark...you know what a fan I am! We're heading out of here on the 21st of September and right now will be back in H'ville around the 9th of October. We're going to Arches National Park, Las Vegas (well duh! ), the Grand Canyon, Sedona, and of course...Murfreesboro, Ark to dig for diamonds!!! and a few other things along the way if the mood strikes us! We'll post at least once more from here...keep your fingers crossed that I get my moose! 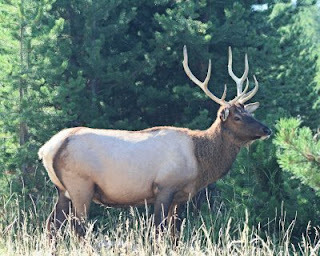 We headed out this morning to Cody, WY and to our surprise ran into a young bull elk in the park, and the Gun Barrel fire in Shoshone National Forest! It's hard to see from this picture, but right in the center you can actually see the flames. We watched the helicopters with their water buckets...best we can tell they are trying to manage the flames, rather than try to put them out. The fire is killing pine beetles that are destroying the forest! We also saw the Le Hardy fire in the park that is still burning. It was impressive but frightening! Let's say a little prayer that all the firefighters will be safe, and that the fires are managed. 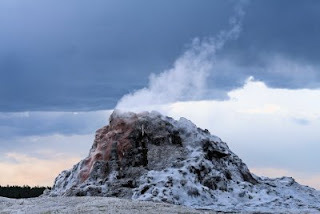 "Step back in time… into the old west of today, at the Irma Hotel, – a place that Buffalo Bill Cody called “a gem” just outside of Yellowstone National Park. Stay in historic rooms that housed some of the most famous personalities the world have ever known such as Frederic Remington, Annie Oakley & Calamity Jane. You can even stay in Buffalo Bill’s private suite, or in a host of other historic or non-historic rooms, all with up-to-date amenities and air conditioning. Enjoy the finest dining in the West, including our famous prime rib. Enjoy a drink and friendly camaraderie at the Buffalo Bill Bar or in the Silver Saddle Saloon. Fancy enough for royalty, and comfortable enough for cowboys and cowgirls, the Irma Hotel is the heart and spirit of Cody, Wyoming!" We're heading home on September 21st! It will take us a few weeks to get home...we are planning some side trips to the Arches National Park in Moab, Las Vegas, the Grand Canyon, Sedona and, of course, Murfreesboro, Arkansas to dig for diamonds! Hopefully we'll be home sometime the first or second week of October. We'll keep you posted. It is already starting to slow down here in West Yellowstone and we're noticing a difference in the park with fewer cars. I'm still chasing a moose with horns, and we're probably heading back down to the Snake River in the Tetons as we've heard there are some there. This has been an incredible opportunity for us to learn that we don't want a gallery, that retail is really hard work, and there are tons of fun people in the world! We had more countries represented in the store than states! With the dollar weak, and other countries' currencies strong, the foreign tourists were here in force and buying lots! Thanks for supporting our faltering economy! I'm watching CNN and struggling to understand an Obama/Biden ticket...I'm not fond of McCain...but I'm struggling without Hillary in the race. This may be the first time that I just throw in the towel and flip a coin. I'm not an Obama fan, Biden is not someone I have much respect for given his inappropriate remarks in the past...where is Hillary going to end up in this scenario. I'll try to keep an open mind and watch the next few months of campaigning before making a choice, but this has been a very disappointing political season. Another Day! Another Car Show!! and a Moose!! Sunday we went to Bozeman, MT http://www.bozemanchamber.com/ for a car show and a visit to WalMart!!! You know we live in the boonies when it's more than 80 miles to WalMart! Woody enjoyed walking around the seeing the cars, even if some of them had been at the Rod Run here in West Yellowstone. While he looked at cars, I shopped! This was a great show because it was downtown on Main Street in Bozeman, and all the shops were open. Some of the galleries were fabulous...hard to believe you're in the middle of the western prairie and mountains and ranches! My favorite place was the Montana Gift Corral http://www.giftcorral.com/ which had fabulous stuff! I bought a new paper towel holder with a pewter moose on top, and a beautiful sterling silver cuff bracelet with a moose on an onyx background. Since I can't seem to find a moose with a rack, or as Woody calls it "a horny moose", I just bought two! The downtown is darling, with old buildings but upscale shopping. I do love college towns near high-end resort areas like Big Sky! If it just weren't so cold, I'd love to live here! It's below zero a lot with lots of wind! Not as much snow as West, but lots of ice according to one of the young sales clerks I talked to during my shopping. Of course, we went to WalMart, but also Michaels, Borders and Johnny Carino's Restaurant for dinner, which serves country Italian! A real town! Yea!!! If it sounds like I'm homesick for Hendersonville and Nashville, you're right! Woody is ready for a boys' day out with Bill and company! Happy birthday to Libby...she turned 32 on Saturday, August 16th! Hard to believe that I'm only 39 and she's already 32! Resting today and tomorrow...we've been going hard for weeks and now I'm pooped. We're having dinner out with friends tomorrow night...back to Bar N Ranch...we may go every week til we leave as it's the best restaurant in West Yellowstone and maybe in the west! There are eight of us going tomorrow night so it will be a blast!! Jackson Hole, WY is Gorgeous! Years ago my Dad told us that Jackson Hole was the most beautiful place in the world. Today we saw what he meant! 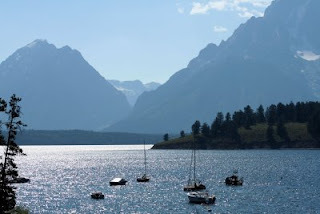 We went to Jackson, WY, a town located in the Jackson Hole valley of Teton County, Wyoming. The drive through the Tetons and the pass was gorgeous. We were glad that it was in the Mustang not the RV! Straight up and straight down. We saw potatoes growing, which was a new thing! 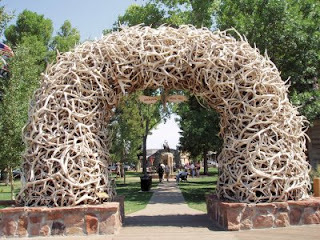 Once we got to Jackson, we did the Antler Arch picture, walked the square and saw the Cowboy Bar and bought tons of stuff. There was even a Staples and a Coldwater Creek. The Coldwater Creek was unlike any I've ever seen...you'd think it was a very affluent community with all the expensive jewelry and suede jackets, etc. http://www.coldwatercreek.com/ I saw a woman with a Chicos bag! We left before I found it, but at least I know it's there! We went to several art galleries and the quality of the work was incredible. There was a moose oil painting for a mere $18,000 that I would love to have had for the living room. Instead we have a post card of two moose kissing that Woody bought me! We headed to Teton Village to ride the gondola, but of course, like Big Sky, MT, it was under construction. We headed through the forest on a gravel road toward Yellowstone, and found Jackson Lake. It was absolutely stunning. Not as big as Yellowstone Lake, but certainly equally beautiful. 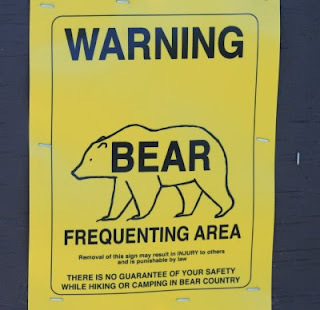 We stopped and saw the warning bear sign, and then right down the road...the bear!! I think we'll head back to Jackson in a few weeks. 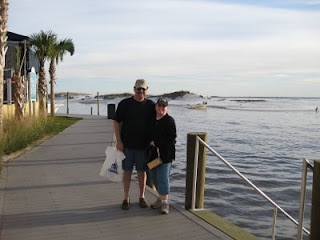 Love to our friends Bill and Jane...Bill's brother died this weekend after a lingering illness. I do hope all of you are enjoying sharing our retirement...except Holly who hates us! There might be a few others who aren't fond of us...we are having a wonderful time, but are ready to see our friends and family! It won't be too long! 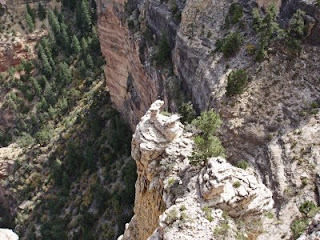 Lewis and Clark Caverns, Red Lodge and Beartooth! We are entirely too busy! I'm falling down on my job of keeping you all up to date! On Monday, we went to Lewis and Clark Caverns. We hiked up the mountain and then down into the beautiful cavern. It was a tough but easy climb...paved path, but straight up! The caverns were cool but I was disappointed that I never saw the bats. Apparently there are thousands of bats and bat babies, but we just couldn't get them to wake up and play! After the caverns, we went to Virginia City which is a ghost town near Ennis, MT. I reminded Woody again that I'm not overly fond of history, but the homemade ice cream at one shop was fabulous. On Tuesday we headed to Red Lodge, MT via Beartooth Pass. We had to wait to go as the pass didn't open until the end of June due to snow...yep, snow. 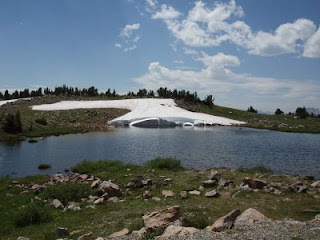 The picture above is about at the top of the mountain and is a beautiful lake with lots of snow still melting! It was quite cool and gusty. The road was winding and straight up and then straight down! I'll post pictures of the road later. We love Red Lodge and wish all the lovely people we met safety from the fire. 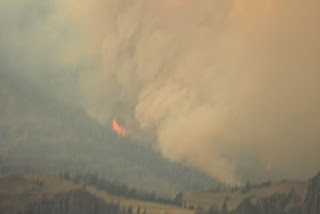 There is a significant forest fire burning 8-9 miles from the town, and the ski lodge is most at risk right now. You can get an update on the fire at http://www.redlodge.com/ The firefighters are doing a fabulous job. One of the things that was interesting, short of the helicopters flying back and forth to dump water/fire retardant while we were lunching and shopping, was the fact that they were using the snow making machines to try to keep the lodge and surrounding buildings wet. You could see the smoke over the hill as you walked down the street. It was a long drive over, so we thought we'd come back a different way through Gardiner and back into Yellowstone National Park. We didn't make it back until almost 10PM, and the park is incredibly dark!!! It happened to be overcast and with the smoke from the Red Lodge fire and a smaller fire in Yellowstone, there were no stars or moon to help light the way. We were concerned that we'd encounter animals unexpectedly, but all we saw was one lonely coyote meandering down the side of the road! We actually had Friday and Saturday off this week so Woody could go to the West Yellowstone 38th Annual Rod Run. For the uninitiated, it was about 300 hot rods! Our store, Buffalo Trading Company, was a sponsor and Brenda let Woody pick the car that we gave our trophy to...it was a Chevy Nomad that he picked out Friday even before he saw the rest of the cars! Here's the car in the parade going right by our store! At the show, we discovered the car is owned by a woman! So appropriate with Brenda owning the store! After the show, we went to Island Park Lodge for dinner with Dave and Geri, our co-workers! and the ones who coerced us into the Lewis and Clark Cavern visit without mentioning the mountain climb to get there! We owe you! It's late...hope you're all having a wonderful summer! Bedtime for me! 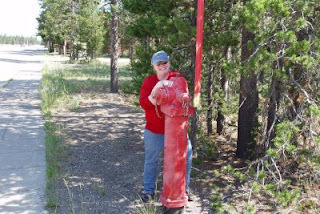 Ok...this is Woody's favorite picture of me showing that I'm barely taller than a fire plug! My argument is that this is a really tall fire plug and even has an antenna so you can find it in the 300 inches of snow that fell last year. Do you realize that 62 inches (well 60 inches if I'm truthful) is my height and FIVE times my height fell in snow? David and Estelle left us Saturday morning and headed south to Jackson Hole, WY. 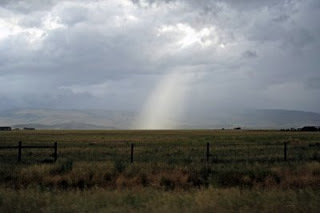 We found out that the night that we had dinner and a bad storm in Ennis, Montana there were 85 mile an hour straight line winds and even moved some of the walls in the church they were building on their mission trip. When we headed back to West Yellowstone, we realized that the power was out in town and huge limbs were littered everywhere. 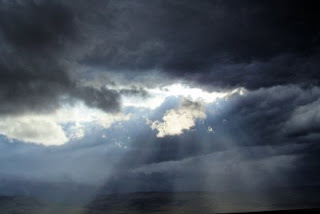 The shots of the light through the clouds is quite spiritual, especially knowing the storms that created these photo ops! We were having dinner in a log cabin and just didn't realize the strength of the winds! Things are busy in the store...Brenda kept telling us that it would get busier! Our photo cards are selling well and going all over the world. We've had more foreign countries represented in the store than states...we're at approximately 39 countries and 37 states. I'm excited for this opportunity. I've spent today working on editing some of my photos and digitally manipulating them to look like oil paintings and pencil drawings. This is fascinating and the more I learn, the more I enjoy the computer aspects of photography. Hopefully at some point I'll have more time to work on them...oh wait, I'm retired...why don't I have more time? We're having the best summer! 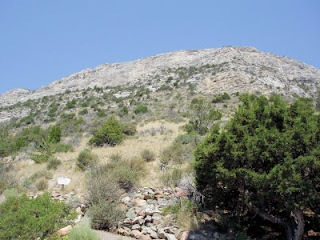 Tomorrow we're heading to Lewis and Clark Caverns. It's a two mile hike and caves! Our co-workers Geri and Dave recommended it. We'll head to Virginia City on the way home. 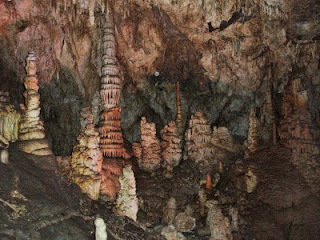 I love caves which makes no sense since I get just a little claustrophobic at times...it's generally when there are too many people, so I guess it's crowds that bug me. The rod run is next weekend so Woody is happy. After that, we need to schedule our trip to Jackson Hole. We are trying to wait til a few of the tourists are gone. That's the crowd thing! 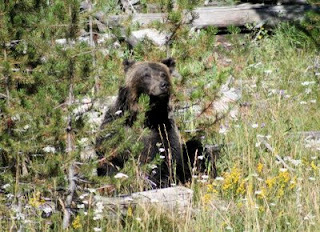 Have a great week...more to come from West Yellowstone! Fun with David and Estelle! 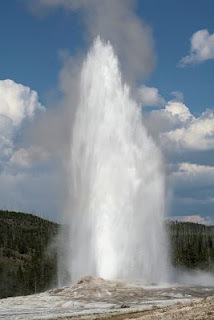 No canasta...David hadn't seen Old Faithful so we headed up to the park after Sunday lunch at the Grizzley Claw Restaurant in West Yellowstone, my personal favorite. 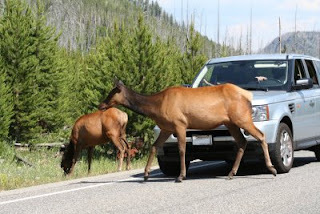 On the way up we saw elk, including three babies, one wading, and a couple who decided to stop traffic including a Land Rover who just couldn't grasp that the elk had the right of way! The eruption of Old Faithful was the first one I've had with a sunny day! 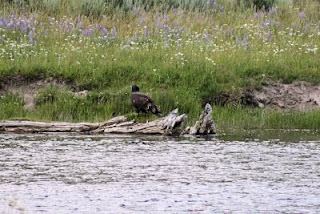 On the way home, the baby eagle was sitting on the side of the Madison River...still learning to fish! Monday, we drove to Bozeman to see Mamma Mia! http://www.mammamiamovie.com/ I think reviewers are crazy...yes it was a bit overdone, but the movie was fabulous. I loved Meryl Streep and Christine Baranski. The rest of the cast was perfect, the songs fun, and the views were beautiful! There were complaints that the story was weak...haven't the reviewers figured out that we go to be entertained not educated!! If I picked apart every movie, TV show, text and internet story, I'm sure there would be tons of inconsistencies! Hello...it's for fun, and this movie is FUN. Full disclosure...I like the play better because the audience gets more involved, but this may be a movie I actually buy so whenever I get low I can watch it! It just makes me want to go back to Las Vegas and see if Mamma Mia is still playing at the Mirage! Today we're heading to Ennis to see the work that David and Estelle are doing on their mission trip. It's a new church project. They are such good people!